In my last post, we looked at Starve.io. A game that is finding its own community even though it is clearly inspired by Moomoo.io. Using a popular game for inspiration is nothing new and nowadays it could be argued that most games are spin-offs of older game ideas. But every once in a while a developer hits it big but fails to achieve 100% user saturation. This is where people start to take advantage. Case in point – Splix.io. 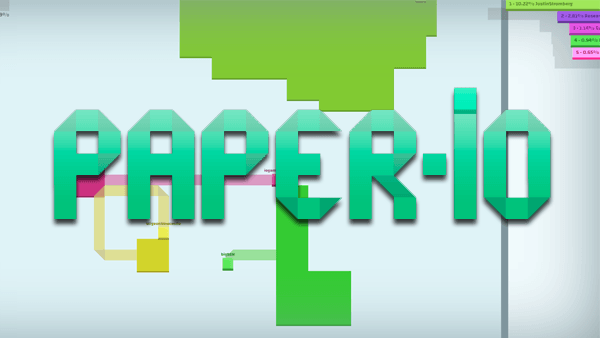 A great game, but the lacking mobile version allowed Voodoo to create the massively popular mobile game, Paper.io. And today, Paper.io has had over 20 million downloads from its Apple App and Google App combined. That is a massive market that Splix.io missed out on. The funny thing is the popularity of Paper.io has its community wanting a desktop version and a private developer spotted this gap in the market and yep you guessed it, he cloned the game. You can now player Paper.io on desktop. The original game is highly addictive and the desktop version is simply a clone of that, so it is easy to see why the clone is now commanding an audience of over 3 million monthly users. If you have never played the game, let me give you a quick rundown. Playing as a small piece of paper your goal is to claim as much of the map as possible. You do this by encircling an area. The more land you claim the more points you get. The map is populated with other players, all of whom are trying to achieve the same goal. And the game allows them to also steal your land. Not to worry, if you see a player on the move with a non-complete trail, you can ram their trail and kill them.